Bill Self focuses on seven principles for effective zone offense and teaches you the Jayhawks' "basic" and "motion" 3-Out 2-In Zone Offense. Coach Self walks you through the necessary techniques of both the perimeter and post players such as quick ball movement, skip passing, lob passing, utilizing the short corner and using high/low motion. 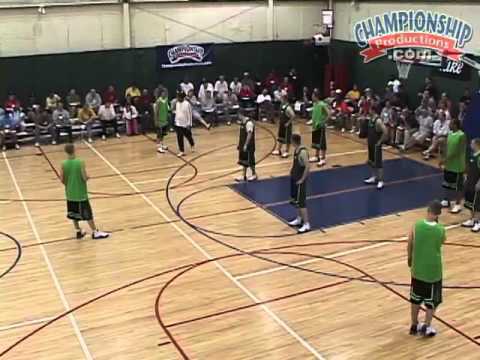 Self also demonstrates drills that any coach at any level can use to enhance the continuity in the zone offense. He discusses responsibilities and reads and demonstrates the cuts, screens and movement for every position. As a bonus, Self also includes a handful of quick-hitter plays and out-of-bounds baseline plays that are guaranteed to work against any zone! This instructional video is the ultimate guide to running a zone offense. Coach Self's teaching methods, techniques and principles allow any coach at any level to implement the Jayhawk zone offense. 3 Ratings were entered with no review. Bill Self: "Basic" and "Motion" 3-Out 2-In Zone Offenses 5.00 out of 5 based on 0 ratings. 3 user reviews.